So far we've been moving the wah pedal in time with the music for rhythm parts and riffs. 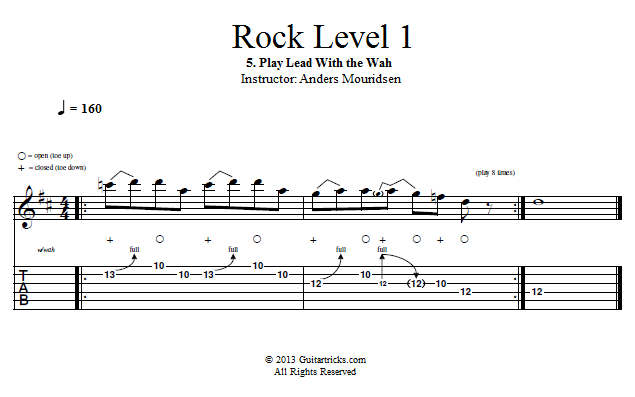 Now let me show you some ways to use it in your lead playing. The first trick is to leave it somewhere in the middle, which will give you a cool and quirky midrange boost! The second trick is to go from heel-down to toe-down for every note you play, which gives you a very articulated "talking" sound. The final trick, which is the one we'll be using, is a combination of those two where you go toe-down with every bend. I'll demonstrate what this sounds like with a rock lick over a backing track. I hope you've enjoyed this introduction to the wah pedal in a rock context. It's a super fun sound to play with, but remember that no effects are necessary in order to be able to play great rock. All you need is an amp and a guitar; everything else is just a bonus. But if you really like the sound of the wah you can obtain one, and now you'll know how to use it. Have fun with it!